Committing to an underwater DSLR system is a major decision. For most underwater image makers, owning such equipment will represent a considerable financial outlay and the opportunities to use their system are likely to be expensive, both in terms of financing photo safaris and also using up precious vacation time. 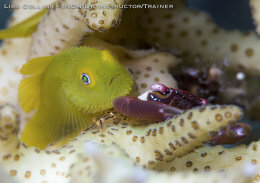 Advances in compact system cameras have empowered many underwater photographers to shoot at a professional level for magazines with smaller, lighter and less expensive camera outfits. Even so, at the highest levels of underwater stills and videography, SLR’s still attract a strong following from demanding enthusiasts, semi – professional and professional users. The latest INON X2 SLR housing range can trace its lineage back more than twenty years. Surprisingly affordable, the INON X2 is a fully professional housing system. It is crafted from the finest materials for durability, handles intuitively for fast, responsive operation, incorporates superb optics for image quality excellence and provides owners with a wide choice of accessories to allow a high level of customization to meet individual demands. Back up support for your INON X2 housing is also not overlooked. Spares are readily available and the uncomplicated controls minimize servicing time and costs. INON UK partner Steve Warren can fairly claim to have started the widespread use of underwater SLR systems in Britain during the mid 90’s. Back then perhaps only 10% of British underwater photographers owned SLR’s. This small group, however, included by far the lion’s share of published and competition winning photographers. Their success was rooted in the flexibility of the SLR system, especially for fish photography. What kept most divers from considering SLR’s was perceived cost and complexity. They used simple film cameras with a limited range of lenses that, in turn, restricted their opportunities to make outstanding images. Steve was able to show that an SLR system could actually be less expensive than an underwater camera at that time, once all the hidden costs were made clear, and SLR cameras had become much more user friendly and versatile with advances in autofocus and TTL strobe control. Steve popularized SLR systems and helped many underwater photographers who had thought SLR’s beyond their financial reach and technical abilities to reap their benefits. Steve brings over twenty year’s experience of supplying underwater SLR systems and meeting the SLR needs of high achieving underwater photographers to INON UK. Lisa has shot professionally with a variety of manufacturers SLR housings over nearly two decades. As a professional underwater photojournalist, Lisa fully understands the housing needs of serious underwater image makers. INON Japan entrusted Lisa with a prototype model of the INON X2 – 6D housing for her personal evaluation before the housing went into production. Deciding which underwater SLR camera system will best suit your own requirements is not something to be taken lightly, especially if it is your first SLR outfit. Just some of the factors to think about include the reputation of the brand, how long the manufacturer has been established, who their UK representative is and whether they have been with that representative long term or keep switching agents, availability of back up including spare parts and how often the housing will require servicing and at what cost. INON UK provides a bespoke service to underwater photographer’s considering the INON X2 professional underwater SLR system. The INON X2 SLR housings are designed to enable each owner to own a housing that matches their specific needs as near perfectly as possible. To achieve this degree of customisation, INON provide a choice of options ranging from viewfinders to strobe connectors to trays and hand grips that all need to be carefully considered. There’s also a selection of ports, port extension rings, manual focus and zoom gears, close up lenses and the unique INON INON UFL-MR130-EFS60 relay or bug eye lens. Discussing your choices in detail with Lisa or Steve is an important part of ensuring your INON X2 fulfils your expectations and ambitions. We understand that you may have a lot of questions, especially if this is your first underwater SLR housing system. Only INON X2 underwater camera housings supplied through INON UK or INON UK official dealers are covered by Lisa, Steve’s and INON UK’s support. Here’s just a few features and benefits of INON’s X2 SLR housing system to get you introduced to INON X2 underwater SLR photography. X2 underwater SLR housings were one of the first equipment ranges designed by INON. INON founder Mr Inoue developed housings for Canon film SLR cameras in the 1990’s that set quality and design values continued in the latest digital X2 housings. Mr Inoue fuses traditional, time proven manufacturing processes with innovative refinements. The housings are made in Japan. INON X2 SLR housings are manufactured using a casting process. This allows INON to incorporate tight curves and angles into the INON X2 range. The term glove housing isn’t used much today, because most SLR housings are machined, making it harder to build a housing that really hugs the camera body it protects – just like a glove. This has led to housings becoming larger for digital SLR cameras than used to be the case with the best designed housings for SLR film cameras back in the day. Small gains in decreasing the size of an SLR housing mean big benefits for the underwater photographer. There’s a weight saving, making it much more likely you will be able to carry your SLR system as hand luggage. A small housing also creates less drag, which makes your housing easier to work with in high current conditions. Handling can also be improved as many users will find they do not need to use hand grips, which, if poorly designed, can make operating key controls difficult, leading to missed pictures. Finally, glove housings can be used in confined shooting situations, making it far easier to take extreme macro photographs or shoot wide angle macro photographs. The INON X2 housings have excellent ergonomics that replicate the familiar way in which we hand hold our SLR cameras on land.The small size of the INON X2 SLR housings means that many underwater photographers will be able to use them without handgrips. This allows the housing to be used more easily in tight spaces and makes lighting extreme wide angle macro images easier. By wrapping your hand around the INON X2’s right side, much as you would hold your land camera, key shooting controls are easier to reach. However the underwater photographers own hand size and length and girth of their fingers and thumbs also influence how comfortable and easy any housing will be to use, as will wearing gloves or mitts. INON offer a modular tray, support and grip system to enable the user to customize handling of their INON X2 to suit their own preferences. The support sits on the right side of your INON X2 and your hand slips between this and your housing. The support slips around the back of your hand. This keeps your shutter release and exposure controls within easy reach. The support accepts connectors for strobes and lights. On the left you can fit a contoured pistol grip. This places your INON X2 manual focus/zoom control within easy reach. It also accepts fittings for your lighting array. The tray allows both the support and grip to be adjusted for width for individual comfort. When using the INON MRS port system, you can support your housing with one hand under the port, just as you balance a land camera with your left hand holding and focusing or zooming the lens. On land we usually have our feet firmly planted on the ground when we take pictures or shoot video. Underwater we often work in mid water. 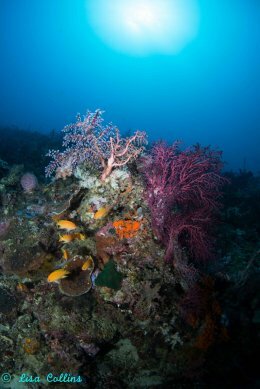 If we are conscientious underwater photographers, we don’t only want great pictures or footage, we want to avoid damaging the environment as well. Most underwater camera systems are heavy and will pitch a diver forward. This makes accurately framing your subject more difficult as the system will be unstable. Holding heavy systems can also cause wrist fatigue. A heavy camera will also sink just as fast as a diving weight if dropped accidentally. With SLR systems the buoyancy characteristics will also alter with changes of lenses. Although it is possible to make a housing and set of ports that are neutrally buoyant, the outfit would be huge and very heavy in air. This makes this an impractical solution. INON provide a range of video light and strobe float arms that allow you to add and adjust buoyancy to balance and trim your INON X2 underwater SLR system to perfection. Although live view screens are easy to see underwater, the eyepiece of an SLR camera inside an underwater camera housing is not. The combination of live view monitors and SLR viewfinders each offers the underwater photographer benefits over the other in different shooting situations. SLR viewfinders are designed to be used with the small eyepiece very close to your eye. Even wearing glasses can mean the edges of the frame are clipped and you have to actively move your eye around to check the corners of the image. If you don’t, distractions can easily creep into your composition. 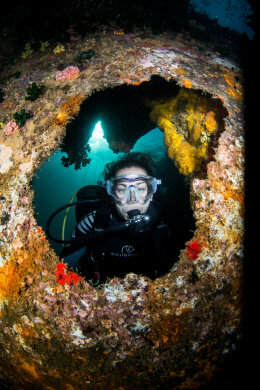 When you try and use an SLR viewfinder underwater, your eye is forced back by your facemask, the hull of the housing, protruding controls and even your regulator. If you only intend to rely on live view, none of these problems need concern you. But if you want to use your SLR viewfinder, it’s important to understand their limitations inside a housing and how these limitations can be overcome. INON UK offer four viewfinder options that you can specify for your INON X2 underwater SLR housing, including three different optical models. The most basic is simply a window in the hull of your INON X2. This will only let you see the centre portion of your cameras viewfinder. This makes accurate composition very difficult. This option is really only viable if you depend on live view or your INON X2 is being used for remote controlled photography. The second option is a reducing viewfinder, often called a pick up finder. 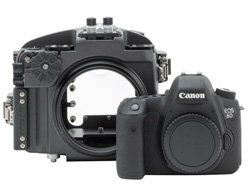 Many underwater SLR camera housings incorporate pick up finders as standard. Pick up finders have significant disadvantages which are often not explained by the manufacturer or seller (one reason we love working with INON is that they are very honest about equipment limitations. These limitations are normally shared by other manufacturer’s equipment. INON prefer to be open with the public about limitations to ensure expectations are met. Of course it helps that INON have often solved or mitigated these limitations!). Pick up finders use simple optics that reduce the size of your cameras viewfinder image. The reduction makes it easier to see all four corners of your focusing screen to aid quick and accurate framing. However the reduction also makes it harder to read viewfinder displays, focus manually and see fine detail that might impair your composition, such as a strobe cable drifting into the edge of your shot. Another problem with reduction viewfinders is that if you only use a small amount of reduction, seeing the corners of the viewfinder can be difficult, even if you use an ultra-low volume mask. Your mask and, quite possibly, your regulator will force your eye back, extending the distance between it and your viewfinder. This tunnel vision is part of what causes the edges of the frame to be clipped. By increasing the reduction, it becomes easier to see the edges of your focusing screen, but the much smaller image just makes framing, manually focusing and seeing displays progressively harder. Housing manufacturers sometimes gloss over the disadvantages of pick up finders. Although they may state the reduction value, such as magnification .60, the use of the term magnification confuses consumers and they wrongly assume it is a magnifying viewfinder that enlarges the image. INON offer two optical viewfinders that incorporate multiple lenses and even prisms to eliminate any viewfinder reduction, meaning you view your focusing screen just as you do on land. You retain the ease of composing, reading displays and manually focusing you are used to. The INON STVF straight viewfinder is an eye level finder, meaning you view through it from behind. The finder is also extended, providing clearance for your regulator. Eye level finders work well for general photography, such as landscape, sports and portraits. But for low angle photography, typical of close up and macro work, they can be restrictive. Sometimes a photographer can get low and still see through the finder by lying prone. This is difficult for underwater photographers because bulky BCD’s can prevent us getting as low as we need and we also need to be conscious of the environment beneath us. A solution often adopted by land photographers is to add a swivelling right angle finder to their camera viewfinder. INON’s 45VF viewfinder offers a swivelling eyepiece set at 45 degrees. Because it can be viewed from above, it allows you to hold your housing below you, close to the seabed, while you remain comfortably above it. This is ideal for close up and macro photography. It’s also convenient for split level work as you can stand and keep the eyepiece clear of the water. The swivel eyepiece makes it easy to compose in portrait or landscape orientation. 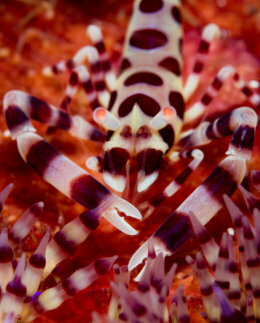 The lenses chosen by underwater SLR photographers are usually very specialised and designed for professional users. These include fisheye, super wide – angle zooms, macro and tele – macro lenses. Naturally, they produce superb images and video, but are costly. The last optic between your expensive camera lens and a subject that may have cost you thousands of pounds to encounter, is your housing port. INON have huge experience of designing lenses for underwater use. INON’s range of wet wide-angle lenses for compact and compact system cameras are known for their outstanding quality and INON UK has supplied INON lenses for Go Pro cameras for major TV productions. INON also created the unique INON UFL -MR130 EFS60 relay lens for wide angle macro photography with specific INON X2 underwater camera systems. You can have confidence in the optical quality of your INON X2 ports and the resulting images you’ll take through them. Two types of port are used with underwater SLR housings. Flat and dome ports. Flat ports work well optically with lenses that have a narrow field of view, usually macro and telephoto macro lenses. Like your eyes behind your facemask, flat ports narrow the field of view and magnify your subject by about one third, making it appear 25% closer. Wide – angle lenses are used behind dome ports. Dome ports reduce some of the optical aberrations that occur when wide – angles are used with flat ports. Dome ports also correct for refraction, meaning your wide – angle lens will not lose a huge percentage of its angle of view as it would behind a flat port. However, wide – angle lenses and dome ports are also an optical compromise. A dome port itself is quite simple. The curve of the domes hemisphere affects both the degree of refraction correction and the edge sharpness of your picture. A steep dome corrects refraction more than a shallow dome. This means all refraction can be eliminated. With no loss of angle, this would be most obvious in a split level picture with, for example, a person as your subject. If the person was standing in waist deep water, there would be no difference in the proportions of the person below and above the waterline. Unfortunately, a characteristic of domes is that they soften the edge sharpness of underwater photographs. This is because a dome, in order to correct the refraction, alters the distance at which light enters your lens and strikes your sensor. The distances are different at the edges compared to the centre of your image. To completely compensate for this and have a razor sharp image across the whole frame you’d need a flexible camera sensor curved to match the characteristics of your dome. In practice, underwater SLR photographers use several methods to keep the edges acceptably sharp. One is to use medium or small F stops to increase depth of field. This means that fast, wide aperture lenses may not be as important to underwater photographers as low light sensors with good noise control. A large dome also helps. This is because domes create a virtual image underwater which means even a far subject appears only a short distance away. The smaller the dome, the closer the subject appears. The closer your lens must focus, the less depth of field you have. A larger dome creates a virtual image that appears further away and you’ll gain a little extra depth of field. Larger domes are also helpful for split level shots as the increased depth of field makes it easier to keep both underwater portions of the photograph and distant parts of the surface composition sharp. Smaller sensor cameras also have greater depth of field when used with lenses designed for that sensor size. However, there are practical limits to how large a dome can be. Large domes are more vulnerable to being damaged, difficult to use in tight spaces and much harder to light when shooting wide angle macro. Close up lenses can also be used to improve edge sharpness. Close up lenses are magnifying lenses and, behind a dome port, narrow the angle of the lens they are fitted to. Less steep domes do not fully correct for refraction, but in exchange for a slightly narrower field of view, produce sharper edges. Especially underwater, where light is diffused and scattered, as explained on the INON UK Level One Underwater Photography Course, poorly designed ports can promote ghosting and flaring, impairing the quality of your picture. They can also reduce the amount of light getting through to your camera as a result of reflection. INON ports are specially coated to control and minimize these problems. INON do not use acrylic in the manufacture of INON X2 underwater housing ports. All INON X2 ports incorporate optical quality glass in their design. It’s important to remember ports are lenses in their own right. Mr Inou’s Magnetic Ring System port is a very clever and practical solution to housing longer bodied zoom and macro lenses and super macro rigs. Underwater SLR systems really combine two housings. One for your camera body and another – your port – to house your lenses. To house different lengths of lenses and to provide control of zoom and manual focus functions, a range of ports and extension rings must be precisely matched. Special gears are fitted to your lenses to enable them to be operated through your housing. Physically short lenses, such as fisheyes, fixed wide – angle and some macro lenses can be focused or zoomed from a dedicated control on the left side of your INON X2 housing. Longer lenses, such as general purpose zooms, wide – angle zooms, tele-macro lenses and macro lenses equipped with teleconverters require extension rings or long ports. Extension rings are simply tubes that fit between your housing and your port to make it fit your lens. They are also required to set the optimum distance between your wide – angle lens and dome ports to provide the best correction to ensure sharp pictures. Using long lenses moves the centre of balance of your housing forward and can badly impair its handling. When thinking about housing ergonomics, it’s easy to overlook the role of the lenses and ports on how comfortable and responsive your system will be to use. INON’s MRS port helps maintain both stability, improving accuracy of your framing, and makes zooming or manual focusing easy. Stability is improved because your left hand cups the MRS extension port just as you’d cup the lens on land. Focusing and zooming is done by rotating the MRS collar, just as you’d rotate the zoom or focus rings on your lens as well. With zoom and manual focus knobs set on the side of extension rings or long ports, you normally have to take away your supporting hand to turn the control. The INON X2 and MRS replicates the time proven fast and decisive shooting lens control of professional land cameras. The INON UFL-MR130-EFS60 bug eye or insect lens is a specialized relay lens. It is designed for shooting stills or video of small creatures up close, while retaining great front to back depth of field. It also helps with approaching shyer animals because it is much less intrusive than trying to shoot wide angle macro with a normal SLR system. This is because the long and slim INON UFL-MR130-EFS60 allows you to keep your distance from your subject. This reduces disturbing vibrations from your exhalations. The 130 degree angle of view and tiny size of the front optic combine to enable literally ‘in your face’ photography of otherwise inaccessible and tiny subjects. The INON UFL-MR130-EFS60 was specifically developed by INON to dovetail optically with Canon APS-C sensors and the Canon EFS60 macro lens. The INON X2 port to which the INON UFL-MR130-EFS60 connects forms part of the optical path. The INON UFL-MR130-EFS60 requires manual focusing, so the premium INON STVF straight viewfinder or INON 45 swivel viewfinders are recommended to make this easier and more accurate. Mounts on the INON UFL-MR130-EFS60 allow strobes or video lights to be attached to provide your choice of flexible lighting control. The INON UFL-MR130-EFS60 is an innovative and highly specialised lens that opens up new and fascinating opportunities for natural history portraiture and creative underwater photography and video acquisition. INON is renowned for the performance and reliability of their underwater camera strobe line up. INON X2 professional underwater SLR housings can support hard wired connections as an option, but are more often used with fibre optic cables. Hard wired connectors were standard for SLR film cameras, since few popular SLR’s had built in flash units, and the underwater strobe manufacturers designed their strobes to work with the cameras TTL protocols. For most digital SLR users fibre optic cables are the preferred choice. INON fibre optic cable are multi stranded, making them incredibly hard wearing. Electrical cables invariably break down with use. Electrical cables also introduce multiple fail points because of the need for seals where the cable connects to the housing and strobe. As many as 60 electrical contacts may also be needed to complete the firing and TTL circuits between your camera and strobe and make it fire reliably. A fibre optic system requires no contacts at all and uses a wet lead that allows the strobe to be disconnected safely underwater for off camera lighting or to be switched to another camera. The fibre optic system also uses the built in camera flash to control INON’s superb Optical Sync TTL exposure system. By using an optical controller, which enables the INON strobes to provide accurate TTL exposure by copying the output of the cameras own flash and takes advantage of the sophisticated flask metering of high end SLR cameras, the many problems of matching electronic TTL protocols are completely eliminated. Professional camera body’s often lack built in flash units. In this case, INON X2 underwater SLR housing users can still benefit from using fibre optic cables. INON provide a converter that takes the electronic signal from your cameras hot shoe and creates a pulse of light that fires your INON strobe. Although TTL exposure is not supported, some INON strobes, like the INON D-2000 and INON Z-240 include External Auto exposure control. This uses a flash meter built into the INON strobe itself to control your INON’s flash output automatically. Lighting control is at the heart of creative photography and the INON X2 provides comprehensive mounts for on board lighting arrays. Choosing your adapters from INON’s extensive strobe arm line up, you can mount multiple strobes or video lights directly onto the INON X2 underwater housing body itself. This can make for a very small, manoeuvarable system for working in tight spaces for macro, super macro, wide angle macro and extreme close focus wide angle photography or video recording. You can also add lighting arrays to the INON X2 support and grip. When you invest in your INON X2 underwater photography SLR system from INON UK or one of our INON UK official dealers, you’ll have Lisa and Steve’s personal support. Along with pre purchase advice, you’ll find Lisa and Steve can often help you meet and overcome the challenges ambitious underwater filming and photography will throw at you in the future. So you can feel free to contact INON UK long after you bought your INON X2 for further advice whenever you need to.